Anthony Conlon enjoyed one of the most successful careers of any player in the first decade of professional basketball. In five seasons, playing on six teams (two in one season), he won four championships. Conlon was a physically imposing athlete, who possessed a charisma that inspired his teammates and thrilled his fans. Conlon was the captain of every team on which he played. 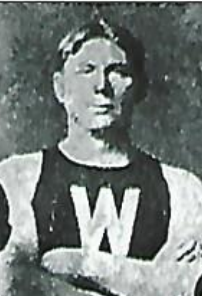 His first success came when he led his hometown Fitchburg team, to the 1899-1900 Massachusetts Basketball League title. During the following two seasons, he collected two more championships as the leader of the Webster team in the Massachusetts Central Basketball League. He collected his final title as headman of the 1903-04 Mystic team in the Connecticut State Basketball League. Anthony James Conlon Born: Oct 7, 1877 Died: Nov 23, 1933 Hometown: Fitchburg, Ma.